A while ago I made and a roasted butternut squash and caramelized onion pizza with gorgonzola and crispy fried sage and I really enjoyed the roasted squash and gorgonzola flavour combo. Manggy left a comment on that post suggesting a maple syrup and squash combo which sounded nice and I was thinking that combining roasted squash with gorgonzola and maple syrup would be a good idea. Since I had some gorgonzola for the mushroom and blue cheese sauce for my steak dinner I thought it was the perfect time to try out the new side dish. The roasted squash with gorgonzola and maple syrup turned out well. Roasting the squash brought out its sweetness when combined with the maple syrup was the perfect balance to the tangy gorgonzola cheese. The flavour of the maple syrup also worked well with the flavours of the gorgonzola and the squash. The gorgonzola was particularly nice in this dish as the heat from the roasted squash started to melt the cheese and it became nice and creamy. Toss the squash in the olive oil with the salt and pepper. Roast in a preheated 400F/200C oven until tender, about 30-40 minutes, turning over about half way through. Mix the roasted butternut squash and gorgonzola cheese. OH MY GOSH this looks amazing! I want to eat it right now. 🙂 I love butternut squash and it seems like Gorgonzola would be a perfect partner…I’ll have to try it! What a great flavor combination. Combined with the steak, sounds like you had an wonderful dinner! Oooh, love the combination of squash and sweet syrup – yum!! The photography on this is BEAUTIFUL Kevin! OMG, that looks incredibly good! What fantastic flavors! This sounds like a delightful combination. This combination of flavors is particularly appealing. You now have my mouth watering. This combination looks amazing! The syrup would make it too sweet but the gorgonzola would be the perfect counter. Delicious! Wow. Fabulous! I am going to make this for my lunch tomorrow, and use up some sweet potatoes lingering in the pantry. Looks like a perfect sweet-savory combo! I love squash and this one looks wonderful yaa. I would never have thought about combining gorgonzola and maple syrup! That’s what I love about cooking blogs; I learn new stuff all the time. The photo of your squash looks terrific! I never try to cook with gorgonzola before. Does it taste the same as regular blue cheese? I think that you may have made my new favorite food. Gloria: This recipe made enough for 4 servings as a side dish. Though I am only cooking for myself I like to have leftovers for lunches at work during the week. katie: I went really light with the syrup as I just wanted to balance out the tangyness of the cheese. Indonesia-Eats: Gorgonzola is similar to regular blue cheeses. There are two kinds of gorgonzola a softer younger one (gorgonzola dolce) that is milder and a harder older one which can get fairly strong. I used the softer and milder one with the squash as I wanted it to melt easier and I did not want the cheese to overpower everything else. You could easily substitute another soft mild blue cheese if you wanted. Your flavor combinations are always so amazing! I love roasted squash, you combo with the maple syrup and cheese sounds wonderful … YUM! You have the most delicious and innovative recipes, YUMMY! yum yum yummy! looks gorgeous. Roasted squash is a favourite of mine. Gorgonzola and maple syrup sound like great additions! I will have to give this a go. Love the idea of gorgonzola with maple syrup Mmmm! wow. that’s all i can say. this combination sounds amazing! As usual, a unique combination of flavors that sound just delicious! Wow, if I hadn’t already eaten dinner, I’d be making this right now. I adore both butternut squash and gorgonzola. Looks like a delicious combination and the photo is wonderful too. Glad I found your blog. That looks like a wonderful combination. Yum! I really love the idea of the sweet from the maple syrup with the savory. You’re always coming up with such tasty treats! What a great combination of flavors here Kevin! Gorgonzola and maple? I’m sold!! This seems like a great side to the steak. Can’t wait to try it. Wow look at that roasted squash! I love that hue! Wow… I love all of the above ingredients but I would have never thought to put them together, this does sound very interesting. Add me to the OMG commenters!! Oh wow…this and a big hunk of steak and I am a happy girl!! Sounds heavenly! I must try that once we get back to winter vegetables. I have so much butternut squash frozen I am not sure what to do with it anymore This is a nice combo with the cheese that I would love to try. Great flavor combination! Looks amazing. This looks great and I have never had this combo before but it looks really good. I love how roasting vegetables brings out the natural sweetness. A winner, Kevin. I love roasted squash and you made it even better! YUM! that squash with gorgonzola sounds great…who doesn’t LOVE gorgonzola cheese? it makes everything taste soo much better! Just pretty and tasty. It’s started a major craving for a sage pork tenderloin that we can scoop up with this. Wow! This site is wonderful! It came up as I was looking for red bean ice cream and most of these recipes made my mouth water. I look forward to trying some out, thanks so much! 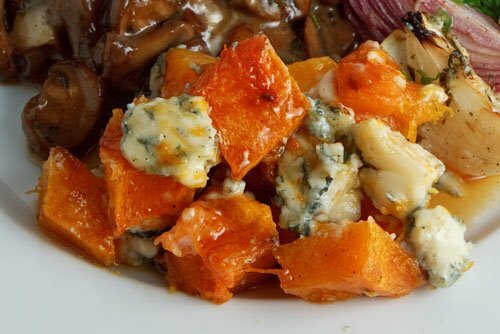 I do love blue cheese with roasted veggies – adding maple syrup would be just the right hit of sweet! I’ve made butternut squash with maple syrup and nuts before, but I’ve never tried adding cheese to it! This looks great! What a great sounding combination! Looks delish. What a great combination. Great flavors too! My gosh that looks amazing, I am new to trying squash and this looks like a winner! The combination of flavors sounds amazing. I’ve been looking for a new recipe for butternut squash for SO long now – looks like I can finally end my search. Thanks! Wow, the innovative combo of gorgonzola and maple syrup makes my head spin. I am definitely trying this recipe! simple and delicious. i would love to try this over some nice quinoa, maybe lightly spiced with cinnamon? WOW – that sounds amazing! I’m bookmarking this right now. Ooh. This sounds absolutely WONDERFUL. I have a squash in my house and I already have dinner started tonight….but I must make this tomorrow!! Thanks for visiting my blog! This squash and maple syrup combo sounds really delicious! And I think I could substitute with vegan cheese. Yum! Your photos are great too! That sounds like a wonderful combination that I never would have thought to try! Love the combo of squash and gorgonzola. Not sure about the maple syrup though. Do you think this would work with sweet potatoes too? sounds like an awesome combo!! Julia: This would also work well with sweet potatoes. I often switch things up by replacing squash/pumpkin with sweet potatoes or the other way around. a lovely combination of ingredients!Looks delicious! Now this would make a nice open sandwich too. That’s it. I’ve decided that I AM a fan and added you to my blogroll. Another wonderful dish! I will definitely be making this recipe again. This dish is spectacular and so easy to make. We had it on Thanksgiving with local Vermont cheese, and it was deeeeee-lish!